Central vertigo is vertigo due to a disease originating from the central nervous system (CNS). In clinical practice, it often includes lesions of cranial nerve VIII as well. Individuals with vertigo experience hallucinations of motion of their surroundings. 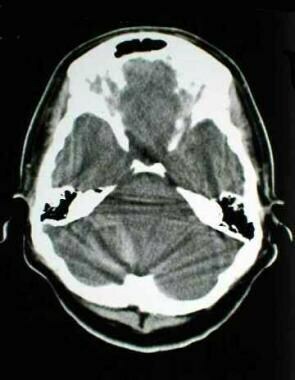 CT scan of a patient with an acute spontaneous cerebellar hemorrhage. The hemorrhage in the right lobe of the cerebellum is partly obscured by bony artifact. Vertigo due to acoustic neuroma is also included in the broader category of central vertigo. An acoustic neuroma develops within the eighth cranial nerve, usually within the course of the internal auditory canal, yet it often expands into the posterior fossa with secondary effects on other cranial nerves and the brain stem. See Vertigo: 5 Case-Based Diagnostic Puzzles, a Critical Images slideshow, to help recognize diagnostic clues in vertigo cases. The brainstem, cerebellum, and peripheral labyrinths are all supplied by the vertebrobasilar arterial system. Thus, the central and peripheral ischemic vertigo syndromes overlap. The basilar artery is formed from the 2 vertebral arteries within the cranium at the level of the medulla. The artery has 3 branches on each side that supply the cerebellum. The posterior inferior cerebellar artery branches from the vertebral artery, while the anterior inferior cerebellar artery and the superior cerebellar artery branch from the basilar artery. All 3 of the cerebellar arteries may have branches that supply brainstem tissue. A labyrinthine artery on each side branches from the basilar artery and supplies the labyrinth and associated structures via the internal auditory canal. In approximately two thirds of people, the basilar artery ends by bifurcating into the posterior cerebral arteries, with small posterior communicating arteries connecting to the internal carotid system in the circle of Willis. Arterial occlusion and ischemic infarction can result from cardioembolism, embolism of plaque from a vertebral artery, or local arterial thrombosis. One or both vertebral arteries, the basilar artery, or any of the smaller branches may be occluded. Even complete occlusion of a large artery may not result in death because of anastomotic retrograde flow via the circle of Willis and posterior communicating arteries. Multiple sclerosis is a demyelinating disease of the CNS. The course generally waxes and wanes, with varying neurologic symptoms and signs. Isolated vertigo may be the initial symptom in approximately 5% of cases. This disease is discussed in detail in the relevant article (see Multiple Sclerosis). Acoustic neuromas are Schwann cell tumors that usually originate on the vestibular division of the eighth cranial nerve in the proximal internal auditory canal. Usually unilateral in development, bilateral acoustic neuromas do occur in young adults, although rarely, in association with neurofibromatosis type 2. If untreated, an acoustic neuroma may expand into the cerebellopontine angle and compress facial and other cranial nerves. If it compresses the brainstem, ataxia, gait disturbances, spasticity, and weakness from long-tract effects may result. See the image below. 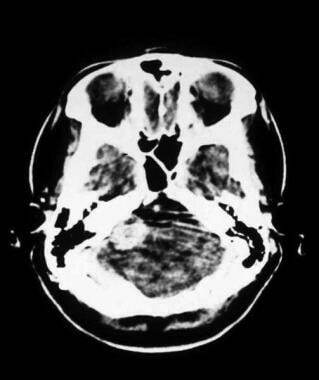 CT scan of a patient with a large acoustic neuroma on the right side of the brainstem. The scan was performed after injection of intravenous contrast, which is critical for identifying tumors with CT imaging. Approximately 500,000 people have strokes each year. About 85% of these strokes are ischemic, and 1.5% of ischemic strokes affect primarily the cerebellum. Ratio of ischemic to hemorrhagic cerebellar strokes is 3-5:1. Up to 10% of patients with an isolated cerebellar infarction present with only isolated vertigo and imbalance. Incidence of multiple sclerosis ranges from 10-80/100,000 per year, depending on the latitude. About 3000 cases of acoustic neuroma are diagnosed each year in the United States. Vascular injuries and infarcts in the posterior circulation can cause severe permanent debilitating disease. The excellent recovery typical of acute vertigo caused by peripheral disease should not necessarily be expected in central vertigo. Acoustic neuroma has a low rate of mortality once diagnosed. The tumor often may be removed with preservation of facial nerve function, but unilateral hearing loss is common. Incidence of cerebrovascular disease is slightly higher in men than in women. In one series of patients with cerebellar infarction, the ratio of men to women was about 2:1. Multiple sclerosis is about twice as common in women as in men. Smouha E. Inner ear disorders. NeuroRehabilitation. 2013. 32(3):455-62. [Medline]. St. Louis EK, Wijdicks EF, Li H. Predicting neurologic deterioration in patients with cerebellar hematomas. Neurology. 1998 Nov. 51(5):1364-9. [Medline]. Chen CC, Cheng PW, Tseng HM, Young YH. Posterior cranial fossa tumors in young adults. Laryngoscope. 2006 Sep. 116(9):1678-81. [Medline]. Selesnick SH, Jackler RK, Pitts LW. The changing clinical presentation of acoustic tumors in the MRI era. Laryngoscope. 1993 Apr. 103(4 Pt 1):431-6. [Medline]. Fitzgerald DC. Head trauma: hearing loss and dizziness. J Trauma. 1996 Mar. 40(3):488-96. [Medline]. Amarenco P. The spectrum of cerebellar infarctions. Neurology. 1991 Jul. 41(7):973-9. [Medline]. Lee H, Sohn SI, Cho YW, Lee SR, Ahn BH, Park BR. Cerebellar infarction presenting isolated vertigo: frequency and vascular topographical patterns. Neurology. 2006 Oct 10. 67(7):1178-83. [Medline]. Huon LK, Wang TC, Fang TY, Chuang LJ, Wang PC. Vertigo and stroke: a national database survey. Otol Neurotol. 2012 Sep. 33(7):1131-5. [Medline]. Kase CS, Norrving B, Levine SR. Cerebellar infarction - clinical and anatomic observations in 66 cases. Stroke. 1993. 24 (1):76-83. [Medline]. Hornig CR, Rust DS, Busse O, Jauss M, Laun A. Space-occupying cerebellar infarction. Clinical course and prognosis. Stroke. 1994 Feb. 25(2):372-4. [Medline]. Halker RB, Barrs DM, Wellik KE, Wingerchuk DM, Demaerschalk BM. Establishing a diagnosis of benign paroxysmal positional vertigo through the dix-hallpike and side-lying maneuvers: a critically appraised topic. Neurologist. 2008 May. 14(3):201-4. [Medline]. Drachman DA. A 69-year-old man with chronic dizziness. JAMA. 1998 Dec 23-30. 280(24):2111-8. [Medline]. Newman-Toker DE, Kattah JC, Alvernia JE, Wang DZ. Normal head impulse test differentiates acute cerebellar strokes from vestibular neuritis. Neurology. 2008 Jun 10. 70(24 Pt 2):2378-85. [Medline]. Norrving B, Magnusson M, Holtas S. Isolated acute vertigo in the elderly; vestibular or vascular disease?. Acta Neurol Scand. 1995 Jan. 91(1):43-8. [Medline]. Lee SH, Choi SK, Lim YJ, Chung HY, Yeo JH, Na SY, et al. Otologic manifestations of acoustic neuroma. Acta Otolaryngol. 2015 Feb. 135 (2):140-6. [Medline]. Simmons Z, Biller J, Adams HP Jr, Dunn V, Jacoby CG. Cerebellar infarction: comparison of computed tomography and magnetic resonance imaging. Ann Neurol. 1986 Mar. 19(3):291-3. [Medline]. Hacke W, Zeumer H, Ferbert A. Intra-arterial thrombolytic therapy improves outcome in patients with acute vertebrobasilar occlusive disease. Stroke. 1988. 19 (10):1216-22. [Medline]. The National Institute of Neurological Disorders and Stroke rt-PA Stroke Study. Tissue plasminogen activator for acute ischemic stroke. N Engl J Med. 1995 Dec 14. 333(24):1581-7. [Medline]. Mayer SA, Brun NC, Begtrup K, Broderick J, Davis S, Diringer MN, et al. Recombinant activated factor VII for acute intracerebral hemorrhage. N Engl J Med. Feb 2005. 352:777-85. [Medline]. Johnston SC, Rothwell PM, Nguyen-Huynh MN, Giles MF, Elkins JS, Bernstein AL, et al. Validation and refinement of scores to predict very early stroke risk after transient ischaemic attack. Lancet. Jan 2007. 369:283-92. [Medline]. Giles MF, Rothwell PM. Systematic review and pooled analysis of published and unpublished validations of the ABCD and ABCD2 transient ischemic attack risk scores. Stroke. 2010 Apr. 41 (4):667-73. [Medline]. Kim AS, Fullerton HJ, Johnston SC. Risk of vascular events in emergency department patients discharged home with diagnosis of dizziness or vertigo. Ann Emerg Med. 2011 Jan. 57(1):34-41. [Medline]. Anagnostou E, Varaki K, Anastasopoulos D. A minute demyelinating lesion causing acute positional vertigo. J Neurol Sci. 2008 Mar 15. 266(1-2):187-9. [Medline]. Bradley WG. MR of the brain stem: a practical approach. Radiology. 1991 May. 179(2):319-32. [Medline]. Bruzzone MG, Grisoli M, De Simone T, Regna-Gladin C. Neuroradiological features of vertigo. Neurol Sci. 2004 Mar. 25 Suppl 1:S20-3. [Medline]. Delaney KA. Bedside diagnosis of vertigo: value of the history and neurological examination. Acad Emerg Med. 2003 Dec. 10(12):1388-95. [Medline]. Froehling DA, Silverstein MD, Mohr DN. Does this dizzy patient have a serious form of vertigo?. JAMA. 1994 Feb 2. 271(5):385-8. [Medline]. Gacek RR. A Perspective on Recurrent Vertigo. ORL J Otorhinolaryngol Relat Spec. 2013 Jun 21. 75(2):91-107. [Medline]. Gizzi M, Riley E, Molinari S. The diagnostic value of imaging the patient with dizziness. A Bayesian approach. Arch Neurol. 1996 Dec. 53(12):1299-304. [Medline]. Herr RD, Zun L, Mathews JJ. A directed approach to the dizzy patient. Ann Emerg Med. 1989 Jun. 18(6):664-72. [Medline]. Hotson JR, Baloh RW. Acute vestibular syndrome. N Engl J Med. 1998 Sep 3. 339(10):680-5. [Medline]. Macdonell RA, Kalnins RM, Donnan GA. Cerebellar infarction: natural history, prognosis, and pathology. Stroke. 1987. 18 (5):849-55. [Medline]. Mayer SA, Brun NC, Begtrup K. Recombinant activated factor VII for acute intracerebral hemorrhage. N Engl J Med. 2005 Feb. 352(8):777-85. [Medline]. Rother J, Wentz KU, Rautenberg W. Magnetic resonance angiography in vertebrobasilar ischemia. Stroke. 1993. 24 (9):1310-15. [Medline]. MRI of a patient with an acute cerebellar hemorrhage less than 24 hours after presentation. MRI allows better resolution than CT scan without bony artifact. MRI is preferred over CT scan for imaging lesions in the posterior fossa. A CT slice through the brain of a patient with an acoustic neuroma. This slice reveals a level of the brain higher than the acoustic neuroma. The dilated third and lateral ventricles provide gross evidence of obstructive hydrocephalus due to pressure exerted by the tumor on the brainstem. A ventriculostomy, seen as a white circle in the right lateral ventricle, has been placed in an attempt to drain cerebrospinal fluid and relieve the excessive pressure above the brainstem. Disclosure: Received research grant from: Zoll Foundation; Laerdal Foundation<br/>Received ownership interest from General Electric for none. for: GE.